I'm not going to have time to cover our cruise adventure in its entirety, so I'll just concentrate on highlights. 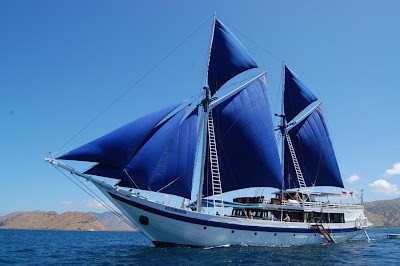 Experiences like our visit to Komodo more than made up for the disappointment that we didn't get to sail, as planned, on the Ombak Putih. When we arrived at the dock, black smoke was billowing from the engine. In the process of a pre-cruise overhaul, a hard-to-detect leak started causing problems. Eighteen passengers boarded, but we were soon whisked off on a luxurious cabin cruiser for a visit to a mangrove swamp while mechanics tried to get the engine functional again. No luck. After the mangrove lunch excursion, we found ourselves on a rather more lumbering, shabbier rival vessel, the Sea Safari VII, looking like something from a Pirates of the Caribbean movie. The serious sailors in our group were seriously disappointed: the height of the Sea Safari's deck meant the sails could never be unfurled. Ombak Putih as pictured on website. Sea Safari VII — Michael didn't realize when he took this photo at the pier that here was the ship we'd eventually be traveling on. We moored off Komodo Island on day 5 of the cruise. First on the itinerary was a trek to see if we could spot some of the world's largest lizards, the (in)famous Komodo dragons: ugly and brutish creatures but fascinating all the same. Their forked pale tongues pick up scents of prey and, touched to the roofs of their mouths, "taste" the smell, which guides them to their victims. We were accompanied at all times by guides with sticks and warned not to stray from the group: two villagers had been killed in the last year. In addition to sixty razor-like teeth, the dragon's mouth harbors both deadly bacteria and, according to a controversial new research paper, highly toxic venom. Some tourists never manage to encounter a dragon, so we were lucky, especially the next day at Rinca, where a not-so-lucky water buffalo, bitten three weeks before, had finally keeled over to provide a feast for the island's reptile residents. I'll combine both sets of photos below. Youngster looking relatively benign . . .
. . . and rather more fierce. I'm reminded of Jurassic Park's velociraptors. These littluns have to stay in trees for the first few years of their lives to protect themselves from, among others, their cannibalistic parents. Claws in this position are reassuring: the Komodo dragon is resting. When we first arrived, they were still warming up in the morning sun. Two of our guides, Tajudin and Dewi. The former is a Komodo native, whose brother was selling the wooden dragons we bought as we left. The least I could do: my Ecco sneakers had no tread and he looked after me on inclines after I slipped on loose gravel. Tajudin was the guide who could answer questions like what the "egg" tree below was. Answer: labu hutan, a wild pumpkin. Kapok tree, a silk-cotton; the soft down of the seeds is used for stuffing. Skulls above? Carcass earlier? Here are other meals-in-waiting. Our third guide, Jess, pointing out one of the deep holes where females lay their eggs. 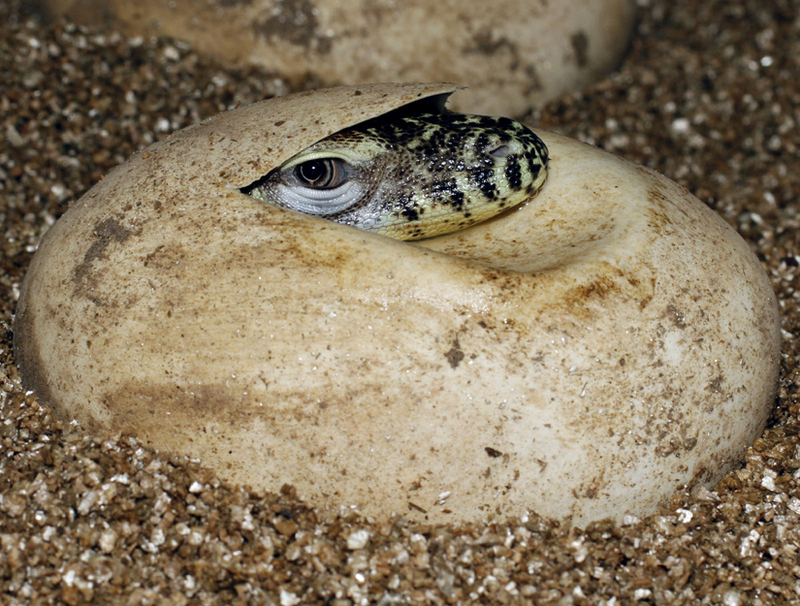 Image of dragon hatching snatched from venom article cited above. And they say a basilisk fixes you with a baleful eye . . . .